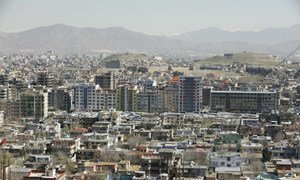 A view of Kabul, the centre of Afghanistan’s social and political life. Photo UNAMA/Fardin Waezi. The United Nations Security Council has strongly condemned the “heinous and cowardly” terrorist attack that took place in Afghanistan's capital, Kabul, on 4 January, killing at least 15 people and leaving some 25 others wounded. In a press statement issued late Friday, the members of the Council expressed their deepest sympathy and condolences to the families of the victims and to the Afghan Government. They also wished a speedy and full recovery to those who were injured in the attack, for which the Islamic State in Iraq and the Levant (ISIL/Da'esh) has claimed responsibility. News reports suggest that a suicide bomber attacked a market in the eastern part of Kabul late on Thursday evening, killing at least 20 people and wounding more than a dozen others. Reaffirming that terrorism in all its forms and manifestations constitutes one of the most serious threats to international peace and security, the Council underlined the need to hold perpetrators, organizers, financiers and sponsors of these reprehensible acts of terrorism accountable and bring them to justice. The 15-member body went on to urge all States, in accordance with their obligations under international law and relevant Security Council resolutions, to cooperate actively with the Government of Afghanistan and all other relevant authorities in that regard.